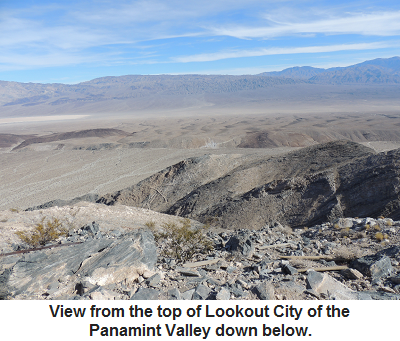 Prospecting for precious history, exploring unique geology, and mining for memories, Pahrump’s own Prospector Bob brings us day hikes and other adventures in our area. CAUTION: If you proceed with your vehicle beyond where I started this hike, which was more or less at the base of the mountain, you will need a VERY HIGH CLEARANCE vehicle with four-wheel drive as the dirt road becomes VERY ROUGH and STEEP. Lookout City is located at the top of Lookout Mountain in the Argus Mountain Range at an elevation of 3579. 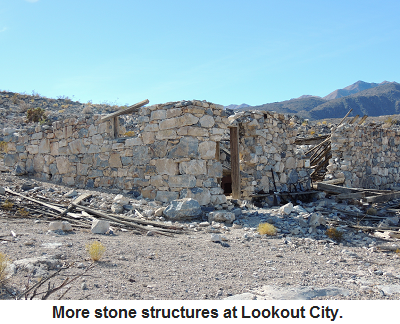 The short lived history of Lookout City all started in 1875 when rich deposits of silver-lead ore were discovered on top of Lookout Mountain. 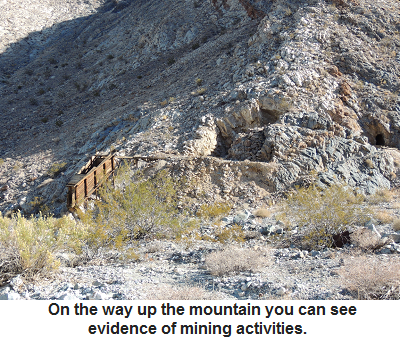 The discovery was named the Modoc Mining Company, and was sold to a group of investors which included George Hearst, the famous mining engineer, U.S. Senator, and father of William Randolph Hearst who was also the great grandfather of Patty Hearst. 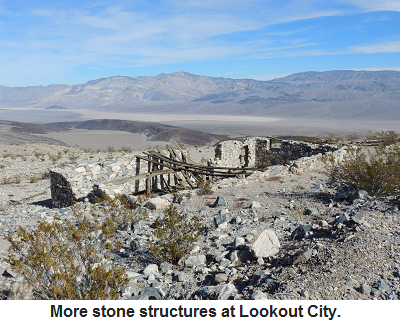 By the end of 1875 the town was in full boomtown status and consisted of 2 general stores, 3 saloons, a slaughterhouse, a hotel, post office and company offices, and as many as 30 wood and stone structures. By 1876 two 60 ton furnaces and a 10 stamp mill were running full speed. By the end of 1876 some 4 million dollars of ore was taken from this area. 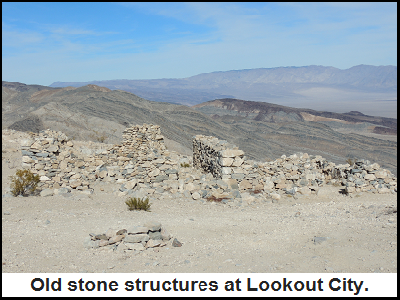 To supply the furnaces with charcoal, 10 charcoal kilns were built in Wildrose Canyon 25 miles away and a steady stream of burros delivered charcoal in sacks to Lookout City via a pack trail on the east side of Lookout Mountain. The summer of 1877 was a busy one, as 40 men alone were employed at Wildrose just to keep Lookout City stocked with charcoal for their furnaces. 1877 saw 140 voters registered at Lookout City, and 8 children from here were enrolled in the Darwin School District. In the fall of 1877, things began to take a turn for the worse. The first blow was both of the furnaces breaking down, and then the mining company changed managers, followed by a drop in the price of lead, and finally the company cutting the miners wages. In the end, the miners struck, and again changes were made in management. The furnaces began operation again, but never returned to the height previously seen. 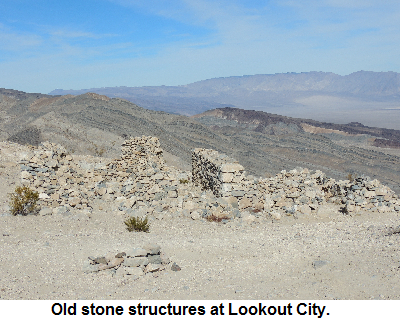 The town of Lookout City was pretty much left of dead by the end of 1878. Before the town’s demise, Lookout City had over 50 dwellings, 5 saloons, a Blacksmith and stable, Modoc Mining Company offices, two General Stores, a post office, and a boarding house with a restaurant. Today there are about a dozen stone walls and foundations of the former town site as well as numerous mining ruins. 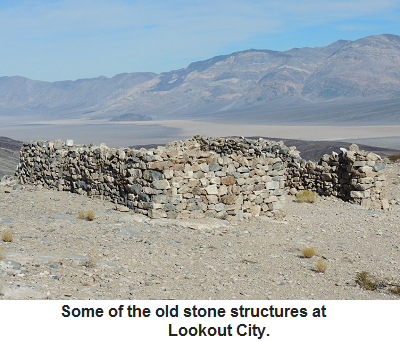 To get here take State Route 190 west out of Death Valley National Park and turn left (south) on the Panamint Valley Road. Follow this road for 7.4 miles, then turn right on Minietta Road (dirt) and follow this road for 3.6 miles until you reach Nadeau Road (dirt). Turn left for about .4 miles, this is where I stopped as the road gets really rough past this point. From here walk the dirt road for a strenuous 4 mile hike up the mountain to Lookout city and have fun exploring.